But that was then. This modern-day royal wedding between Prince Harry of Wales, grandson of Queen Elizabeth II and his American actress bride, Meghan Markle, was seen by approximately a seventh of the entire world’s population with massive, unprecedented global press coverage. A courtship that played out in public, complete with a few family tribulations not unfamiliar to most such occasions, reached its much anticipated climax in the chapel of the historic Windsor Castle where the pair were officially married. While most watched by television or some other device, the couple were cheered by 100,000 people who had actually attended on the sidelines of the streets of Windsor. 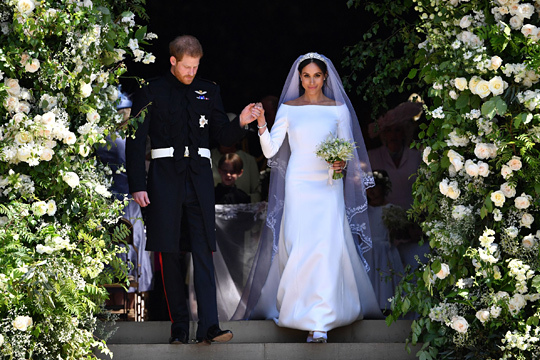 And it was a day full of enchantment - from the simple elegance of the bride’s dress and long train created by the British designer Clare Waight Keller at the French fashion house of Givenchy, to the celebrated black revivalist touches in the service, the African American choir, and the enthusiatic 14-minute sermon from African American Bishop Michael Currie. Adding to the anomalous events of the day, the famously independent-spirited bride announced that she would bravely break with tradition and make a speech at the wedding reception; no doubt likely pulling it off successfully, she looked not only radiantly happy throughout the day but extremely at ease. The 36-year-old actress is, of course, the second American woman to marry a member of the British royal family. In 1936, King Edward VIII’s intention to marry twice-divorced Wallis Simpson was opposed by the British government, sparking a constitutional crisis which led to Edward’s abdication. But attitudes have changed, and – more important - the likelihood of Harry succeeding to the throne is not probable with several in front of him. Shortly before his marriage, Prince Harry dropped from fifth to sixth place in the line of succession to the British throne following the birth of Prince Louis, third child of older brother Prince William. Prince Charles is the heir apparent, followed by William, and then come William’s children - George, Charlotte, and Louis. The assembled guests likewise reflected the social and cultural ties of what some call the Anglosphere, bringing together stars like George Clooney and Oprah and members of the British aristocracy, as well as the cast of Suits, the television show that marked both the peak and the end of Meghan Markle’s career as a professional actress. Being Her Royal Highness the Duchess of Sussex carries a price however. The Royal Family, from the queen down, scrupulously avoids taking public positions on political, and to some extent social issues, and time will tell whether the outspoken duchess will be prepared to live within such constraints. She intends to make the British Commonwealth the focus of her official role. The national flower of each of the 53 Commonwealth member states was woven into her trailing, silk tulle veil, from the African violet of Tanzania to the hibiscus of the Solomon Islands. Moreover, she and the prince came together over a shared interest in social activism. They first met in Canada when Prince Harry was there for the Invictus Games, which he originated. As for Prince Harry, the wedding may have represented closure of sorts. The Guardian newspaper pointed out that the only previous time that he had appeared before a worldwide television audience of comparable size was 21 years earlier, when, as a sad and lost young boy he walked through the streets of London in the funeral procession of his mother, Princess Diana. “Many could say that his mother’s spirit was represented by the presence of Elton John at his wedding,” commented the paper. Years earlier, at the wedding of Princess Diana to Prince Charles, the officiating Archbishop of Canterbury, Robert Runcie, had said, “Here is the stuff of which fairy tales are made,” but it wasn’t quite the case. From all accounts, the marriage of Prince Charles to Lady Diana Spencer was, if not formally arranged, at least initiated behind the scenes as a suitable match by Queen Elizabeth, the Queen Mother, widow of King George VI and her close friend the Countess Fermoy. And, again from all accounts, Charles never completely cut off his long standing liaison with the woman who is now his wife, Camilla. The Charles and Diana “fairy tale” didn’t have a happy ending. A bitter divorce had followed, and the couple had gone their separate ways - and this, too, is doubtless stored in Prince Harry’s memory. But there are differences. Prince Harry’s first meeting with Meghan Markle is a classic boy-meets-girl story which certainly didn’t qualify as a suitable match, and which needed no palace help for the couple to fall in love. Two days after the wedding, with a major cleaning up operation still underway in Windsor, the Duke and Duchess of Sussex carried out their first public function – a garden party at Buckingham Palace. The American duchess’ royal life had begun.